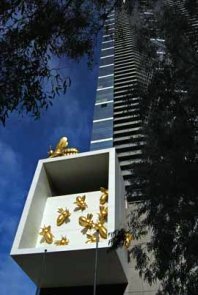 Take a leisurely stroll along the Yarra River Artwalk route here in Melbourne and you'll come across lots of outside artworks and unique contemporary venues containing art or holding art performances. The best way of making sure you don't miss anything of importance is to print off the Yarra River Precinct Artswalk map which also has information about the venues/exhibits. Log on to www.yarrariver.info/artswalk.pdf and print off the brochure. The walk takes anything from 90 minutes to a whole day depending whether you go into the art venues or just amble along outside. ........You'll pass venues such as The National Gallery of Victoria, The Arts Centre and the Australian Centre for Contemporary Art. Many of the venues have free access to at least some of their art. Crossing over the river you'll find Scar - A Stolen Vision, created by eight indigenous artists. 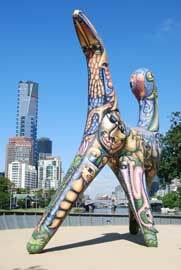 You'll also come across indigenous artist work in Birrarung Marr near the end of the walk. Altogether, you'll be directed past 23 outside art exhibits and 12 buildings related to the arts. The walk ends in Federation Square where you'll find a number of venues such as Kirra Galleries which is devoted to glass art, the National Gallery of Victoria:Australia where you'll find Australian art and the Australian Centre for the Moving Image which has free films and computer games to watch and play. All this plus the river scenery to watch. What a great way to spend a day!